Cara tells us what a special day it was for Sara and Anthony Customs House wedding, as they became husband and wife surrounded by loved ones and their gorgeous children. Cara was thrilled to see groom Anthony’s kind feedback pop up on their Brisbane City Celebrants Facebook page after the wedding, thank you so much for your kind feedback and congratulations to the happy newly-weds. 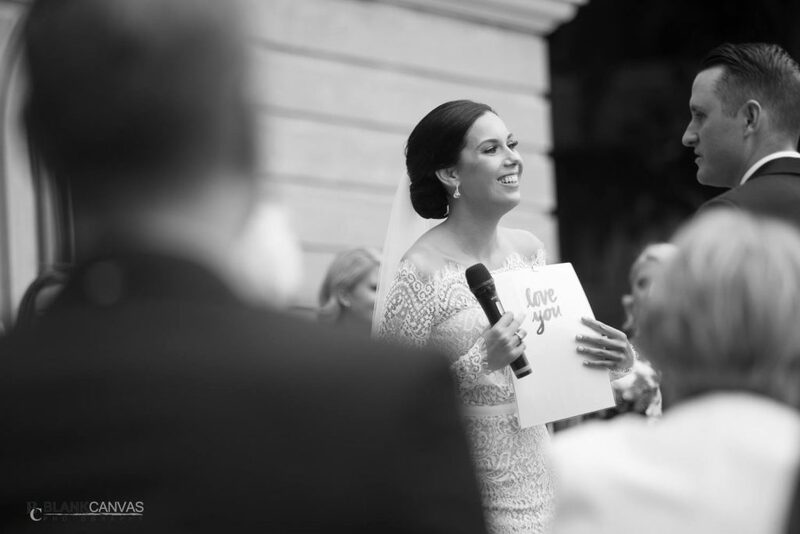 On a side note how cute are Brisbane City Celebrants bespoke vow cards with the oh so apt ‘LOVE YOU’ message on the reverse, so beautifully captured here by Jon at Blank Canvas Photography. If you are looking for a Celebrant for your Customs House Wedding, Cara Hodge of Brisbane City Celebrants would love to hear from you. View more weddings with Celebrant Cara Hodge on the blog here, and contact Cara over at Brisbane City Celebrants for more information and to confirm availability for your Customs House wedding.